The woodwind section of the Delaware Hayes High School Marching Band plays through a section of this year’s show Thursday. Members of the band practiced from 9 a.m. to 9 p.m. last week week and endured temperatures that nearly reached 90 degrees. The Delaware Hayes High School Marching Band practices during band camp Thursday afternoon in Cornell Stadium. The band would practice small sections of music and drills over and over until the drill was muscle memory and they had the music memorized. It’s afternoon on the football field at Cornell Stadium and the sun-baked, sweat-soaked Hayes High School Marching Band is entering its sixth hour of practice. The heat index continues to inch toward 90 degrees. A cloud shields the students from the sun for a moment between drills and the students in the band cheer. 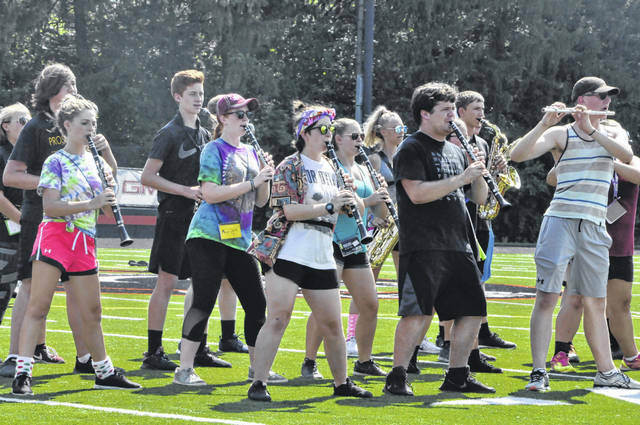 Band Director Andy Doherty said students also practiced the prior week from 9 a.m. to 4 p.m., but he said last week was the week where the band really learned the music and their drills, despite the intense heat. Doherty said the band spends its time practicing inside, in the the new parking lot where the tennis courts once were or on the football field, when the football team doesn’t need it for practice. “The only time we can get the field is during the hottest part of the day,” Doherty joked. Doherty added he makes the band play and march only a few measures of the show at a time so that he can adjust and critique as needed on a micro-scale before trying to watch the whole show and pick out areas that need work. He said sometimes he’ll just watch one section of the band during a repetition of the drill and will just move through sections every repetition until the whole band nails it. At the end of each repetition, Doherty tells the band to “adjust” so the members can make sure they are standing where they should but with some students only missing their marks by inches. Quinten Metzger, a junior and three-year veteran of the band, said he enjoys band camp. Caleb Richardson, a senior and tenor player in the drumline, said the week of band camp is where the drumline gets the most done but said band camp also creates unity in the band because everyone spends so much time together. Likewise, Alessandro Nocera, a junior, said band camp is a chance for the whole band to get to know each other both on the field or at other functions like meals or band dances. Kovatch said the band is learning at a good pace this year, and said the band has been learning faster than previous years. 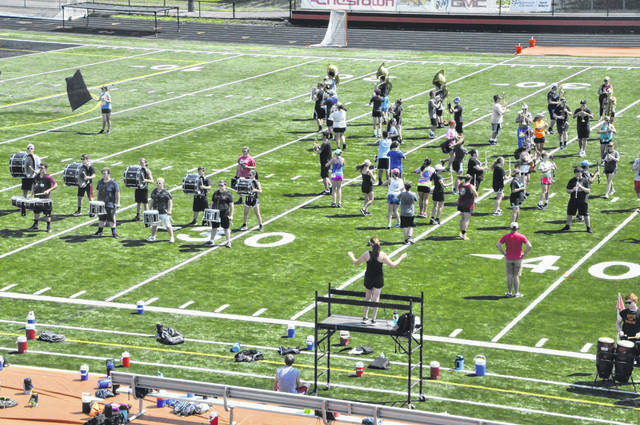 While frequently moving areas to give the field to various teams can be frustrating, it’s also a lesson according to Neal Goulet, a senior clarinet player. Doherty encouraged everyone to come check out the band and its performances during halftime of Hayes High School football games.